Each year, IU South Bend’s commencement ceremony recognizes the hard work of graduates and ushers in the next stage of their lives. 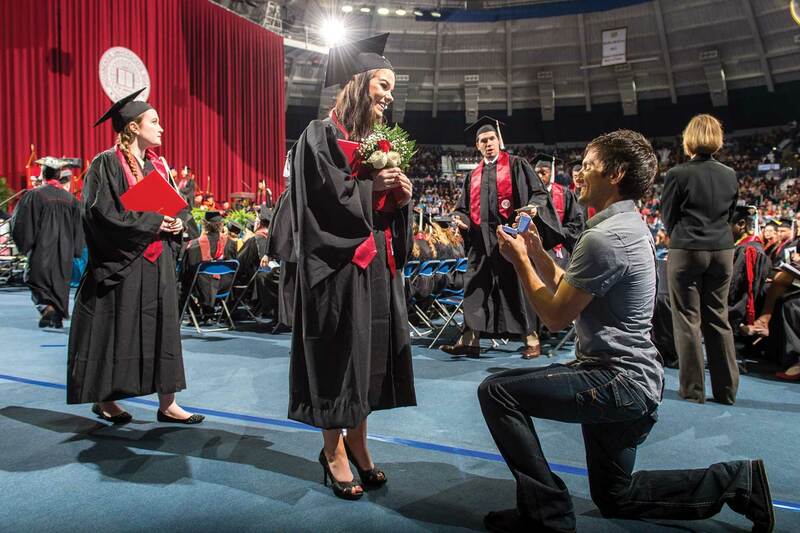 For IU South Bend 2016 graduate Stephanie Meyers, the new beginnings continued when her longtime boyfriend Austin Hamsher surprised her with a public proposal as soon as she was returning to her seat. “I was super shocked. He came out of nowhere as I was walking back. I thought he was just giving me flowers, but then he got down on one knee,” explained Stephanie. Stephanie said yes and now she is embarking on a new journey, personally and professionally. She will be using her Bachelor of Arts in Sociology for her new job in skills training and care facilitation at Bashor, a collaborative partner of Oaklawn Psychiatric Center. Both Stephanie and her fiance Austin are from Nappanee, IN, and went to Northwood High School. They met five years ago through mutual friends and are now looking forward to what the future holds as a married couple. “We haven’t set a date, but we’re just so excited,” said Stephanie.